Above: courtesy Doug Kerr. 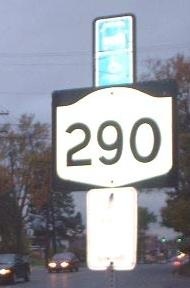 This is not I-290. NY 290, which crosses underneath the I-690/I-81 megachange but doesn't have direct ramps to either of those routes, WB courtesy Doug Kerr. WB farther east on the route. Those are heavy-duty utility lines crossing on top of a medium-duty railroad trestle.